What kind of mother am I? I haven’t placed a single Christmas present under the tree yet. It’s been up, waiting, since Thanksgiving weekend. But alas, no presents yet. When the boys were little, this mom (like many others) made sure at least a few presents were displayed the very day the tree went up. To fail would be unconscionable…to me, and especially to my expectant little red-heads. As a little girl, I remember so well the evenings Mom would disappear behind a locked door, in her bedroom down the hall. Next would begin the “march of the Christmas presents” as she’d walk the length of the hall with a smug, sneaky half-smile on her face, building a trove of brightly colored treasures under our tree. Surely she was tired; her days were full just like mine are now. No matter. She especially delighted in watching me discover a new piece she’d added to the collection when I wasn’t looking. She loved it at least as much as I did. My boys are young adults now, 21 and 18 (just turned) and their fervor has calmed a bit as they are pre-occupied with finals and the more weighty realities of “grown-up” life. My own enthusiasm is a bit diminished this year. It’s ok, I tell myself. My collection of Nutcrackers adds life to the otherwise deserted tree skirt. That’s enough for now, right? You know…maybe it’s not. 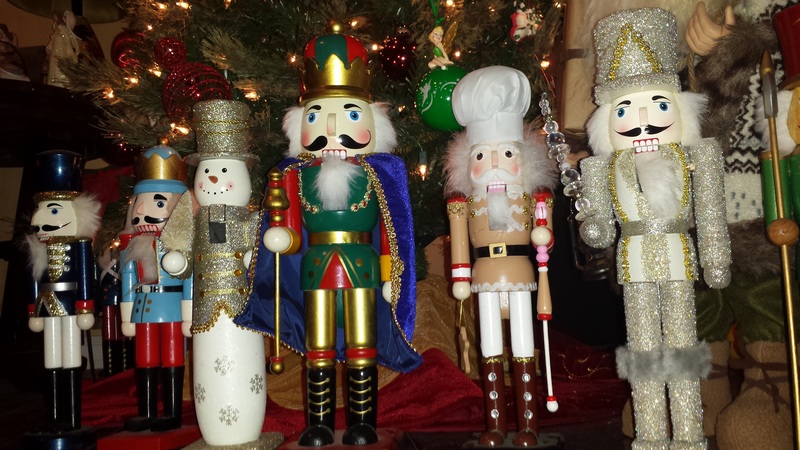 I think I will lock myself away this evening and give those Nutcrackers something to guard.